Once upon a time there was a three-headed monster, and he was the only one of his kind. He did not look at all like what you would expect a three-headed monster to look like. His three heads didn’t sit next to each other on giant broad shoulders. 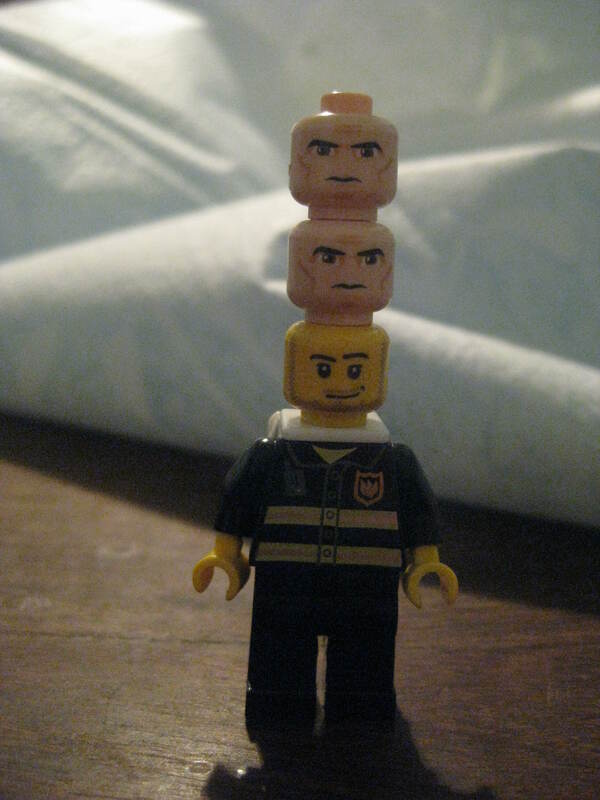 Oh no, his three heads sat one upon the other upon the other on top of very normal man-sized shoulders. As you might imagine, this made him extremely tall, so tall that he was always hitting his top head on doorways as he walked through them. For that reason, the top head was convinced that he had the hardest lot in life. This sort of bickering and fighting is how the three heads spent all their free time. The arguments tended to get repeated a lot because the they never had anyone to talk to but themselves. A three headed monster is quite terrifying to look at, so no one ever came around just to chat. It didn’t help that the monster got his food by hiding behind trees along the road and jumping out at passing travelers, scaring the lights out of them and then stealing their food. That was not the sort of behavior likely to make friends. And worse, it was starting to get harder and harder to get enough food that way, due to the fact that no one wanted to travel on a road known to be guarded by a three-headed monster. Fewer and fewer travelers passed that way, and the three-headed monster got hungrier and hungrier, and the three heads fought more than ever. They knew they needed a new way to find food, but they couldn’t agree on the plan. The top head thought they should travel to the other side of the mountain where there was a different road and there might still be many travelers to scare. The middle head thought they should join a traveling circus and earn money as a circus act. The bottom head thought they should make a huge hat to cover the top two heads and then go and find a regular job in the village. Round and round and round they went. Naturally, the top two heads wouldn’t hear of being covered up like that, so the argument went on and on. Probably they would still be arguing to this day if a very brave hunter hadn’t come by while they were fighting. The hunter had heard the rumors that a three-headed monster lived along this road, but he was too brave to be put off by that. He wasn’t even sure he believed it. But as he came through the woods, he heard the three voices raised in anger and soon he saw them, perched on top of each other and all talking as loud as they could. They were talking so loudly, in fact, that they didn’t hear him get out a bow and arrow and aim it just at their one heart. They were so distracted by their quibbling that they barely even felt the arrow go straight through, and the middle head was still making a very good point when the whole monster toppled over dead. The hunter carried the three-headed monster all the way back to the village, so that everyone could see it before it was buried. And the three heads who could never agree on anything all ended up in the same grave. Time Out Tuesday – Can We Try This?